The mystique of the Dhofar region or of Salalah is not its salubrious climate or its architecture but the sacred perfume, one of the gifts given to Baby Jesus by the THREE WISE MEN. This aromatic incense or Frankincense was the source of wealth and riches of Dhofar and Arabia and exported by caravan routes and ships to far of China, India, and Egypt to be used for temple rituals, cremating the dead and for medicinal purposes. It was not a Shining Star, but luck that led me to this scent of antiquity. Walking around Muttrah souq or the local market overlooking the Corniche in downtown Muscat, I happened to overhear a tourist bargaining with a shopkeeper and it took few minutes to register that they were referring to frankincense. I looked around and there it was all around in the tiny cubicle-shop, stacked on shelves in plastic containers and gift packs with colorful ceramic and wooden burners. A visit to the library and I learnt more about the ordinary looking gum and its importance as maker and breaker of kingdoms. The sweet smell had intrigued writers and thinkers from Roman historian Pliny (writing in AD 66) to THEOPHRASTUS, STRABO and ARISTOTLE, who alluded to the sweet-smelling spice wealth of South Arabia. Pliny mentioned that Emperor Nero burned an excessive amount of frankincense, equal to the production in Arabia, at his second wife’s (Poppaea) funeral. In the 6th century Herodotus also recorded that about two and a half tones burnt in the temple of Bel at Babylon. Its amorous qualities are recounted in The SONG OF SOLOMON, which mentions hills of frankincense and large quantities used to scent Solomon’s couch. Worth its weight in gold in its diplomatic role, frankincense, was also used for embalming rites and religious purposes. For nineteen centuries the place of origin had intrigued travelers, kings and explorers. It was in the middle of 19th century that Dr. H.J. Carter, Assistant Surgeon in East India Company identified the Dhofar region in Southern Oman as the source of this untold wealth. The steppe region (najd) directly north of the Qara Mountains,Oman, possessed the necessary geographic and climatic conditions to make this area, since ancient times, the major source of this aromatic riches. From here it was shipped in vessels to ports in the Bay of Sachalites. Caravans carried the rest across the WADI MITAN and Wadi Fasad (a trek that covered the entire breadth of Oman). Later excavations, especially of the lost city of UBAR (The Atlantis of the Sands) believed to be a center of frankincense trail from 5000 BC till 2500 BC., refuted Roman historian Pliny’s belief that there was one single or high road through which trade was carried. The excavations discovered numerous feeder routes linked to rise and fall of Arabian empires. At the height of its trade about 3000 tons of frankincense was sent from South Arabia to Greece and Rome. It was also shipped to China and India by sea and land and along the Red Sea to the Mediterranean world. One can picture the caravans trudging across inhospitable terrain carrying their precious cargo across the peninsula to whet the whims and fancies of rulers from the Mediterranean to China. The hardships of transportation contributed to the mystery and value and to safeguard their interest the people of Dhofar, who controlled this lucrative trade, invented stories of dragons guarding the trees. This along with the inhospitable climate must have created obstacles for anyone venturing near the sacred trees. No wonder frankincense was much in demand as a gift for friendship or favors by none other than the Queen of Sheba, (who till now to me had been another fictional character out of Arabian Night). Sheba is said to have visited King Solomon to distribute frankincense and myrrh that would be beneficial to both of them. A visit to the real frankincense country of Dhofar in southern Oman became imperative. The ancient traders took months and years to reach the source but now it is a mere one hour by air from Muscat to Salalah, the present capital of the Dhofar region. As the plan touched the tarmac, a fresh, moisturized breeze welcomed us and we knew that we were in Salalah, the summer capital of Oman. From June to September is the Khareef or summer monsoon season when the entire country side turns green and fruity. The road to Holiday Inn, where we were staying, ambled past papaya, banana and coconut plantations, a bonanza for passing motorists and for roadside kiosks, a lucrative business. 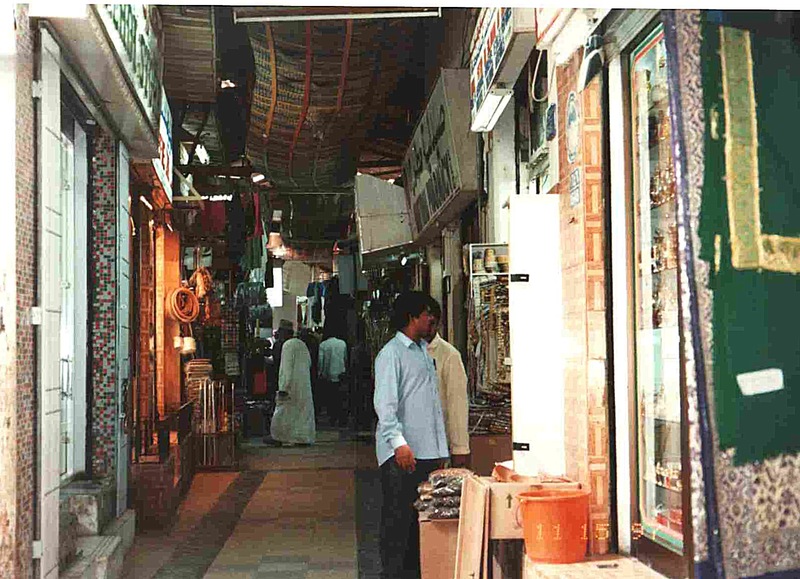 In 1996 Salalah was still a developing city of a Pizza Hut, souqs and residential areas existing along the ‘old’ city of beige, sand colored buildings and houses. The dabs of color, in an otherwise bleak landscape, were provided by coconut palms swaying in rhythm to the continuous rain dance; the multi-hued and multi-layered flowers in roundabouts and roadsides; speeding vehicles and brightly painted doors and windows of old and new houses. The colorful doors on Dhofari houses were a legacy of Zanzibari influence that dated from Imam Sultan ibn Saif, when Oman was under Zanzibari rule from middle of seventeenth century till middle nineteenth century. There was a triangular link of African, Indian and Omani influences as Oman’s Indian Ocean possessions extended from Makran coast, which is today Pakistan, to Zanzibar and Pemba island. Indian and African ideas mingled with Arab mindset to create a spectacular form of architecture and design. 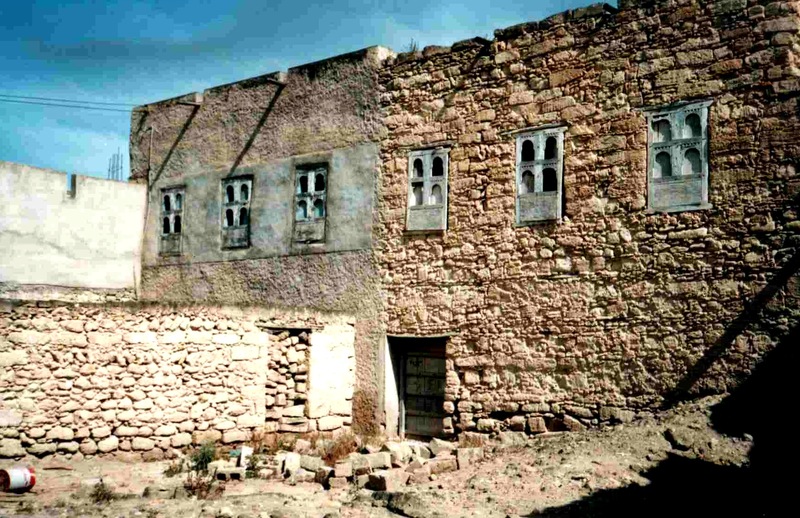 SIR DONALD HAWLEY in his book OMAN & ITS RENAISSANCE mentions that the houses in Dhofar and Hadramut built-in mud brick covered in stucco, are more distinctive than of the north. The houses, several floors high with arched windows covered with wooden screens of the mashribiya type.” To us the houses resembled the ‘havelis’ of Rajasthan and Gujarat especially the ‘jaali’ style of the windows. Later when we visited the Salalah museum we could see the strong Gujarati influence in women’s dresses and the embroidery done on them. Our acquaintance in Salalah arranged an evening tea at his Omani friend’s house on the evening of our arrival. We received the traditional Omani welcome of being ‘smoked’ with bokhur. The Salalah Bokhur is stronger than the Sur or Ibra variety and can really smoke one out. The Bokhur or fragranced wood was burned in a silver burner and placed in corner of room. When we were leaving it was wafted around our hair and underarms giving us a fragrant send off. 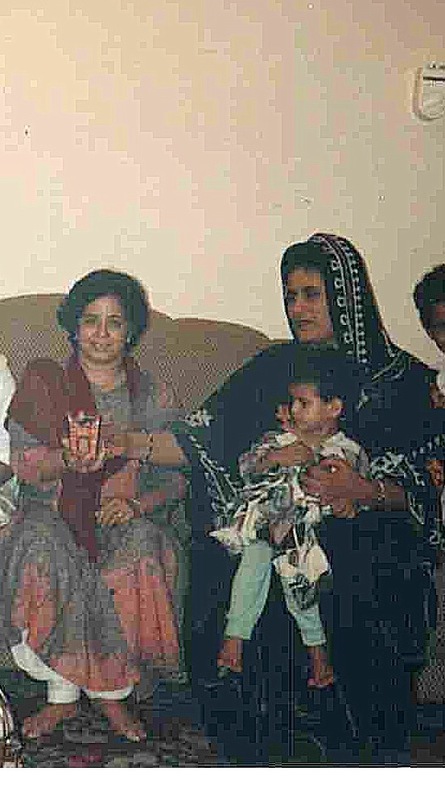 The proceedings were translated into English by the Omani friend and the interesting part was when the wife, expecting her fifth or sixth child looked at my stomach and said “khalas” meaning ‘no more’. She was really surprised at seeing only two children and in her way felt sorry for me. I wanted to explain to her that this was personal choice. She must have been around thirty-five but looked fifty as continuous child-bearing was taking its toll on her body. After a sumptuous feast of halwa, fruits and Omani sweets, shared from the same plates, the wife gave me a gift of attar and a scarf matching with my Indian dress, and we promised to send the photographs we had taken. The ‘honor’ of our visit was the drive to Jebel Qara in their brand new 4-wheel drive. The road winding through green valleys and hills shrouded in monsoon mists was a breathtaking sight, the grazing cows and sheep adding to the English country-side flavor. Being a Thursday afternoon cars were perched at precarious positions on cliffs with their occupants making full use of the weekend. The favored picnic spots are generally the caves, natural springs and green areas of the valleys. Living in semi desert region, water in any form is a welcome sight be it the beaches, a stream or collected rainwater. The sea follows the city or vice versa and there is a point supposedly closest to Malabar coastline of Kerala and on a clear day one can see the Malabar coastline, a temptation for people across the seas. We walked the private Holiday Inn beach hoping to come across ‘sos’ bottled messages from across, the Indian shores, but all we could see were crabs desperately trying to out swim the windy waves. An imposing landmark on the coastline is the AL HISN palace originally built by Sultan Turki Ibn Said and added on by successive Sultans. One has to take special permission to visit the palace. The drizzle that had welcomed us on first day soon turned into an ongoing highlight and we enjoyed it to the maximum thinking about the heat of Muscat. Day 2 was devoted to knowing more about frankincense or luban, ordinary beads of gum, but then when you think of all the history associated with it, it assumes colossal proportions. Our first stop was the Frankincense or the Old Souq in the Haffa area. One could spend hours rhapsodizing over Frankincense, eastern perfumes and attar, clothes, silver jewelry and collectibles on display. Equally colorful and intriguing were the tribal women in their traditional clothes and accessories selling assorted articles from herbs to dried fish, spread before them. I tried to make them pose for me and even promised to buy something. They refused categorically, covering their faces even before I clicked. Later we came to know that one is not supposed to photograph women without prior permission. A friendly shopkeeper willingly shared his knowledge with us reeling off names and expecting us to follow. Of the little I could understand that the NAJDI from the Najd Mountains is the best followed by SHAZRI from the Qara Mountains and then SHA’ABI from the coastal plains in the South of Oman. The colors identified their value and purpose: The yellow one is for incense burning; the amber used for medicinal purposes and the white for chewing for healthy teeth and gums. From the mercantile atmosphere of the souq it was on to the old city/ port of SUMHARAN on the coastal inlet of KHOUR RORI three km from Taqah. A 30 km metal track runs along the coast passing through camel country of rocks and shrubs. 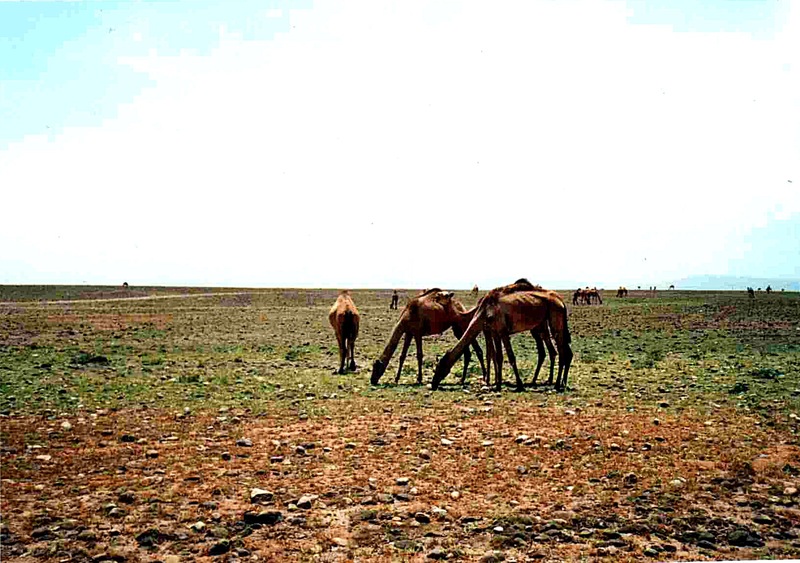 Camels, big, fat, small and ugly were on both sides of road merging with the brownery of the landscape. The locals refer to camels as natural speed breakers and at one point we got a dose of their stubbornness when we had to stay put for nearly 30 minutes till a group leisurely crossed over. Maybe it was their supercilious attitude or permanently constipated look that contributed to their haughty expression. But at this time they reminded of Victorian ladies out on a stroll with the highway as their promenade. The camel is supposedly the “only beast to know the hundredth name of God, the one great name which possesses all the divine attributes.” (Wendell Phillips) and maybe this contributes to their hauteur. All along the drive to and from Salalah we looked around for the frankincense tree, a colored shrub, known as Boswellia Carterai, and 8 or 9 ft. In height. Later learnt that the trees require little water and the further inland they are away from coastal monsoon the better the quality of incense. This explained the reason we did not see any trees as we were traveling along the coast. The ruins on the coastal inlet of Khour Rori are believed to be the legendary palace of Queen of Sheba, and that of King Ilazz of Hadramut (also known as Eleazus). It was also a port from where frankincense was shipped to Eastern Mediterranean countries. From the highway it was difficult to make out the ruins and we drove halfway on what appeared a tar road surround by cliffs and desolate country side, only to return to the highway. We did go back again after verifying from passing motorist. This exercise must have lasted for about an hour, thanks to two similar roads leading to Khour Rouri, that finally when we did spot the ruins were too tired to venture inside. The setting sun and hammering waves added to the desolateness of the surroundings and we decided to drive on to Mirbat, the former capital of Dhofar and center of Frankincense trade with Iraq and Syria through Yemen. A quick look around, it was getting late and unlike the camels had by now exhausted our ration. It was a hungry group that descended on at Hasin bin Thabit restaurant in the commercial center of Salalah. One thing we missed in Salalah was a choice of good restaurants. ( 14 years is a long time and Salalah must be a different city now). A picturesque setting coupled with a fascinating history has given Dhofar its own place in Omani chronicles. We visited Al Balid, a commercial center of the period just before the beginning of the renaissance in Western Europe. ibn Batuta and Marco Polo, described it ‘ as a beautiful large and noble city”. Another place to visit is Mughsail, 40 km from Salalah and accessible through tortuous cliffs, low broken hills and cattle country along the coastline towards the Yemen. It turned out a pictorial delight with giant waves crashing against jutting cliffs shrouded in mist set off by eerie whistles emanating from blowholes formed by the eroding sea. A scene straight out of Jane Austin’s WUTHERING HEIGHTS and I expected Heathcliff to appear any minute. Water gushes out through these holes with such force that the holes remain covered with wire-meshes for safety of people. It was drizzling but this did not deter few families to picnic under the concrete shelters built along the white sand beach. Another picnic spot is Ayn Razat, around 30 kilometers from Salalah. Ayn means spring and Ayn Razat serves the Razat area. There are a number of springs collected together in a man-made pool and youngsters, mostly boys, were enjoying the cool waters. Three days in Salalah were insufficient to see the city landmarks and its monuments: Jobs tomb; the lost city of Ubar on the ancient caravan route and the bird sanctuary. According to legend Ubar was the “Atlantis of the sands’ and located about 100 miles from Salalah. Finally it was time to board the flight for Muscat with our prized possession, a pouch of frankincense, multi-hued wooden burner and a cane ‘Salalah’ walking stick. Nice article on Salalah. I was in Salalah for eighteen months in 1982-83 on my first posting in the Sultanate. I have been to the Jebal area in Dhofar mountains where Frankincense trees grow. At that time some Jabalees were staying in the cave dwellings in the hills. I have been to the beautiful beaches of Muqsail, Mirbad and the legendary capital of queen of Sheba in Taqua. Indeed Salalah is unique in every sense. Salalah along with rest of Oman is a place worth visiting. My husband was in Muscat for 6 years and we returned in 2000. Very interesting; makes me want to see more of your work.